How Fast Is the Flash in Justice League? There were an awful lot of surprises that dropped last weekend during San Diego Comic-Con, but without a doubt the Justice League teaser trailer was the most buzzed about thing to come out of the convention. 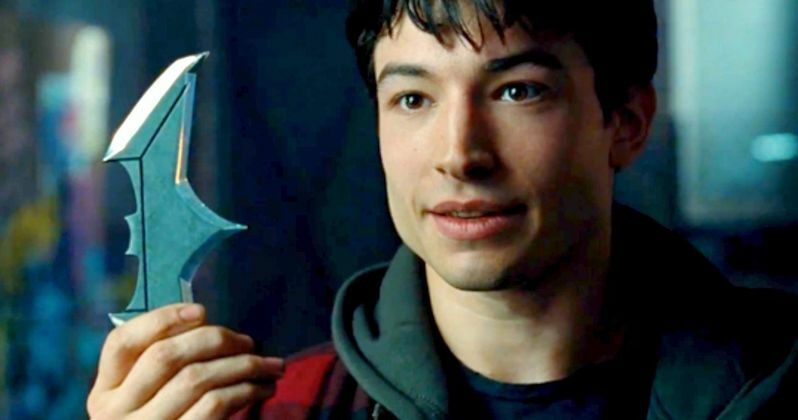 The footage showed off bits and pieces of the various members of the team, but we probably got our best look at Ezra Miller as The Flash. We know he's fast, but the scene shows just how fast he really is, and now science has stepped in to get a little more specific about Barry Allen's speed. The website thescienceof.org decided it would be fun to mathmatically figure out exactly how fast The Flash was moving in the footage. Even though the process to figure it out is a bit complicated, they break down the whole thing step by step in a way that is pretty easy to understand. Essentially, they looked at how long the sequence took in Barry's time, which was about 21 seconds. Then, they looked at how fast Ben Affleck's Bruce Wayne would likely have been throwing the Batarang to determine the difference between real time, and Flash time. Here is how they broke it down. "We're not locking this in as an "always has to be" for the Flash, but in this instance, when Bruce threw the Batarang, time slowed for the Flash by a factor of about 62. In other words, when the Flash is "at speed" in the same way as shown here, 1 second in our world equals roughly 62 in his. One minute for us, a shade over an hour for him, if he's "at speed" the whole time." They ultimately determined that .34 seconds in real time equated to 21 seconds in Barry's time. The site figured that Bruce throws his Batarangs at roughly 30 miles per hour, and that the one he threw in the trailer traveled a distance of roughly 12 feet, but they say it could be as much as 15. After determining the speed, they then gave a bunch of examples of things that The Flash could do that we couldn't, such as slow down time and solve complex problems during conversation. They didn't dive into it much, but they also added that given his speed, he may experience the effects of special relativity, and age slower than the rest of the characters in the DC Universe. Many fans of the character had their doubts about Ezra Miller playing him heading into this first Justice League trailer. There are plenty of fans of The CW show The Flash who felt Grant Gustin deserved a shot at playing the role on the movie side of things as well. But the response to this initial footage has been positive, and it helped wash away the weird taste that his cameo from Batman V Superman: Dawn of Justice left behind. We won't have to wait all that long to get a better look at Miller as The Flash either, as the most recent Suicide Squad trailer teased at least a cameo from the character. Not only that, but the Fandom wiki recently uncovered a final cast list for Suicide Squad, which lists Ezra Miller just under Jai Courtney. So be ready for some more Barry Allen in the near future. We don't know exactly how much screen time he will get, but we will get to see that insane speed from The Flash on display when Suicide Squad hits theaters on August 5. After that, Miller will appear with his fellow superhero friends in Zack Snyder's Justice League movie on November 17, 2017. He is then set to headline his own The Flash solo movie on March 16, 2018, which is being directed by Rick Famuyiwa.